Shopping for Teenage Mutant Ninja Turtles Mugs? Have a bowl of soup and put it into a mug instead with the Teenage Mutant Ninja Turtles Soup Mug Set! Or, you can have giant cups of coffee. Either way, you'll get to hang out with your favorite characters from the hit Teenage Mutant Ninja Turtles series! 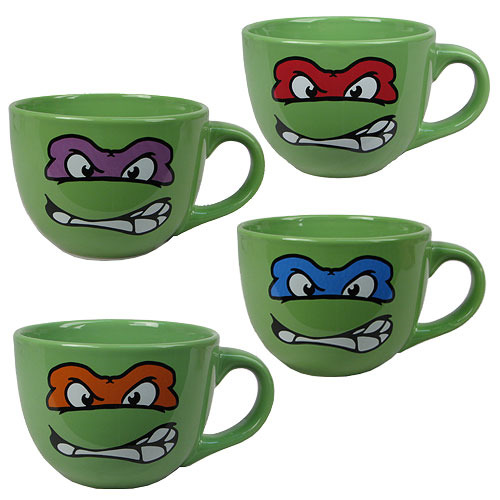 You'll get soup mugs each for Mikey, Donny, Raph, and Leo! Ages 14 and up. Bowl holds up to 24 ounces of liquid.